It may have seemed like Wu Xiubo's scandal last year has blown over. After actress Chen Yulin claimed to be Wu Xiubo's mistress for seven years and went on to claim that he had affairs with several other women, the scandal quieted down as months passed and Wu Xiubo resumed activities. However, it looks like things have gotten quite ugly behind the scenes. Chen Yulin's parents recently wrote a letter to the public that is going viral today. They reveal that their daughter has been arrested last November on charges of extortion. 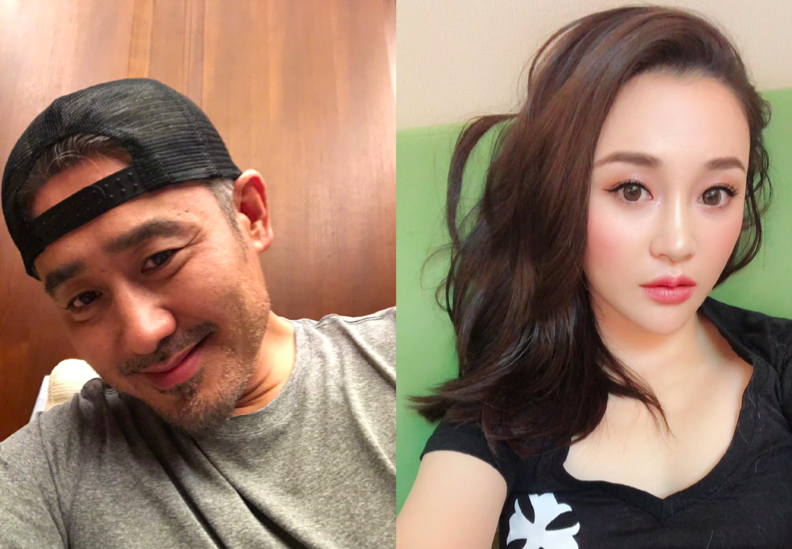 They explain that last fall, after their daughter revealed details about Wu Xiubo, Wu Xiubo, his manager and lawyer requested that Chen Yulin (referred by her parents as Mu Mu) retract her false statements. 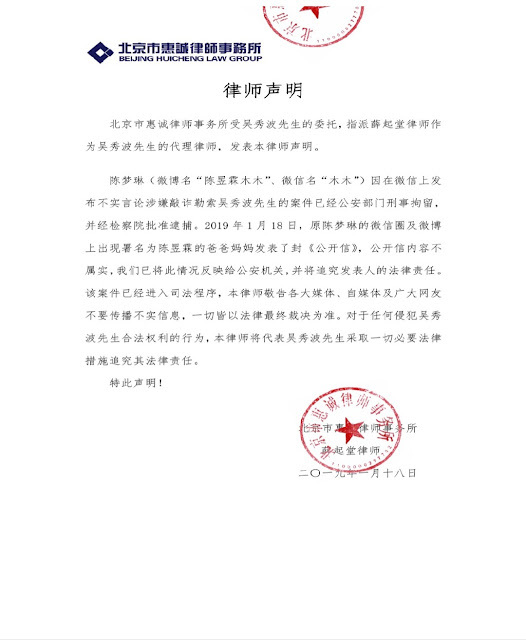 Wu Xiubo's side was willing to provide financial amends to Mu Mu. Mu Mu and Wu Xiubo reached an agreement that she will stay abroad. During that time, Wu Xiubo used the excuse that his account has been frozen to pay only a small portion of the agreed amount. On November 4, 2018, Wu Xiubo called Mu Mu on the phone and asked that she return to the country to discuss matters. When she arrived on November 5, 2018, she was arrested by police at the airport. They learned later on that Wu Xiubo had filed a case against Mu Mu on charges of using information on him to extort money from him. Mu Mu is currently in jail and if proven guilty, she could be face more than 10 years of imprisonment. Mu Mu believes that she is innocent and hopes that justice will prevail. 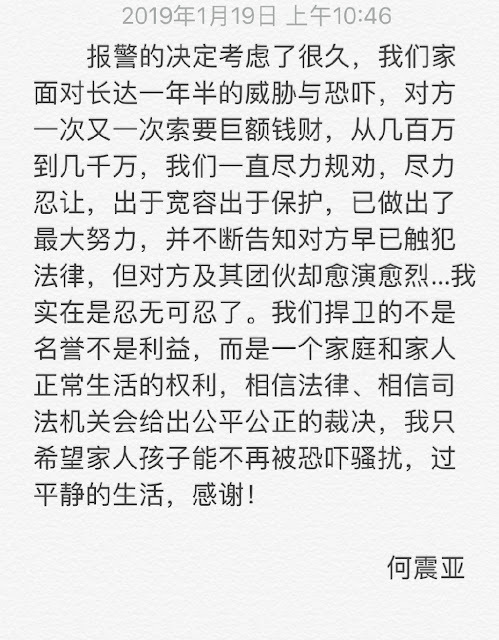 According to Mu Mu's parents, they were only able to communicate with the lawyers of Wu Xiu's talent agency in the past two months who informed them that their daughter's actions have caused Wu Xiubo at least 1 billion yuan of losses and may have destroyed Wu Xiubo's career. They say that Wu Xiubo's lawyers warned against revealing the matter to the public because his side will resort to legal action. Mu Mu's parents end the letter by saying that they are willing to do anything to protect their daughter and they wish for her safe return. After the parents letter started trending, Beijing Huicheng Law Group which represents Wu Xiubo quickly issued a statement confirming that Wu Xiubo had Chen Yulin arrested on charges of extortion. They also counter that the statements made by Chen Yulin's parents are false and they are working with the authorities to take legal action. Wu Xiubo's wife and manager He Zhenya also issued a statement to explain their decision to have Chen Yulin arrested. According to her, they deliberated for a long time about whether or not to report to the police. Their family has been blackmailed for a year and a half and the other party has repeatedly asked for money from a few million yuan to tens of millions of yuan. They continuously warned the other party of breaking the law. He Zhenya wrote that it reached a point where she could not bear it any longer. With their decision to sue, they are not protecting their reputation or interests but their family. It is clear she did blackmail them. She should be charged as so. They were in a willing relationship. I bet the mistress gain her share of wealth too. She is dumped and now cried for attention. Wu Xiubo is a scumbag to have a affair but he is not the first nor last. I dont know if it will affect his career for too long either. Will just wait and see. He did have a affair, truth is now out. He can bare his own consequence. What I find funny is that SHE is the claimed the reason because he lost that much money and not his ways. Even if she did blackmail him, it is still weird to see it like that. Wu Xiubo is a scumbag. He had a bunch of mistresses and even apparently hit this one, but since she came out and told the story about him she is at fault for causing him losses. What a joke. I believe her side just because it makes sense that he offered her money to shut up. It is infuriating how trash men get away with stuff like this just because they are powerful. Since SARFT likes restricting dramas based on moral character of the actors, they should block all his stuff. It would be so unfortunate for the rest of the crew and actors if they do block his projects. They all work so hard and put so much effort for one actor to bring it all down. Sorry..whatever it is. .this guy(Wu xiubo) actually is not a good person...he can do anything to make that woman shut down her mouth...he doing all this just because he has a lot money...but he must remember one thing..money can't buy anything..his reputations are broke down and his soul will never be at peace..I hate this hypocrite guy..
Wu Xiubo is a disgusting old fart who was married but started a relationship with a 18-year-old. There’s a huge power imbalance there. The girl’s parents are awful for not protecting their daughter from this disgustingness. I hope Wu Xiubo suffers a lot.